Teach Your Dog to Calm You in 5 Easy Steps – ComeHereBoy! My German Shepherd Bronco was a stray that I rescued. Very thin and quiet in our first weeks together, I helped heal him and we soon bonded very strongly. Now, the tables have turned. Bronco is my healer, much more sensitive to my needs than I ever was to his. He can sense when my mood begins to turn and comes to my side with ears back, brown eyes full of concern and puts his head in my lap. His mere touch relaxes my body; he is my hope for a functional future. I struggle with bipolar disorder with occasional anxiety popping up when I least expect it (is there any other time it shows up?) Thankfully, this year has been the first winter in the last three that I haven’t had a full meltdown panic attack and I have to credit that to Bronco’s intuition. He has helped me feel so much better. Everyone knows that dogs help lower blood pressure and their owners also tend to have a greater sense of well-being. You love your dog and he or she waits on your every word and adores you. What you may not know is that there’s a big untapped potential there – for nearly any dog – if you struggle with stress, worry or mental disorders. You may not have a dog quite as intuitive as Bronco, but you can teach him or her to help you when asked. You might have heard of psychiatric service dogs. These service dogs can help a patient control a debilitating mental illness inside and outside of the home. Even those who struggle with agoraphobia can find they are able to go much further with their best friend by their side. A dog can bring real hope to those who find that medication doesn’t seem to work, causes side effects or only takes them so far. Dogs are a scientifically proven, side-effect-free prescription for your brain. I want to share a quick exercise that you can use to teach your dog to help stop anxiety, panic or to just relieve stress. Your dog doesn’t have to be trained as an ESA (emotional support animal) or PSD (psychiatric service dog) to do this for you and you don’t even have to have a diagnosis to find it calming. This is the basic pose that generally your dog would do if you were lying down. The technique behind the exercise is called deep pressure therapy (DPT). Studies show that it can calm those with autism or help relieve anxiety, depression, self-harming behaviors, and it can even help just plain old stress. DPT helps make attacks of any sort shorter in duration and easier to bear. DPT is generally pressure to the abdomen or chest by your dog. (In self-harming behavior, it can be pressure to the body part that is at risk.) 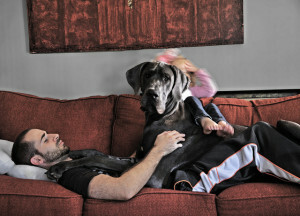 A small or medium sized dog can lay on your chest while you lay flat on your back and a large dog can drape his or her paws across your lap and then press his head into your torso to provide the pressure, or drape himself halfway across your torso if you are on your back, depending on what’s comfortable for you. 1) Get out some delicious treats and find a couch. Put a treat in front of your dog’s nose and slowly draw the treat away from the nose toward the back of the couch. Pat the couch with your hand and excitedly say your dog’s name. 2) If your dog puts his front paws up, say “Paws up! Good boy!” and reward with the treat. If your dog is medium or small size, you’ll want to get all four paws up on the couch before you say “Paws up”. You will also then lure them into a “down” on the couch. If your dog doesn’t “paws up” at first, you’ll have to reward for things close to what you want. Putting his head on the couch, putting one paw briefly on it, etc. Withhold a treat to get them to do a little more next time until they are getting all the needed paws up. Practice this until you can say “paws up” and he can repeat without any coaxing. 3) Call your dog off the couch with “Good boy! Ok!” or “Paws Off!” and pet and praise him. Use this whenever your dog gets off the couch on his own or when you want him to get off. 4) Now, lay or sit on the couch and pat your chest or lap and say “Paws up!” Your dog will likely be confused and stiff at first, but give a treat for anything they’re willing to offer until they get the idea and begin to relax. You might have to lure again. Reward often at first. Ideally, a small or medium dog will lay on your chest vertically with paws on shoulders and head next to yours. You will need to practice the command “down” on your chest. If you begin to get frustrated, stop what you’re doing, give a fun or easy command and end practice. Try again later. This may take time for your dog to get used to. A large dog will put his paws on either side of your hips, or lay their chest horizontally across your lap. 5) Extend the time your dog is required to lay on you by extending time between treats and when you say “Paws off”. Over time, you can replace treats with verbal praise or petting over longer periods of time. Other stuff: For large dogs, you’ll need to teach them to push their head or lean their shoulder into your torso. Once your dog is familiar with paws up and they begin to relax, they should naturally lean into your torso for support, at which point you should always reward or praise them. A dog that has to stand on his hind legs should be released every five minutes so he can rest for one minute before getting back up while you’re practicing. If you have an full on panic attack, this may or may not be possible to provide, which is ok.
You’ve trained your dog to provide deep pressure therapy on command! Enjoy the relaxation and bonding time and start feeling better! If you want to go a bit further with this, you can train your dog to do this on his or her own whenever you begin to have a panic attack or other incident. All you need to do is mimic the symptoms you have – fast breathing, sobbing, pulling hair, shivering, etc – and then tell your dog “Paws up”. Keep practicing this and rewarding it and eventually your dog will pick up the signs on his or her own and you won’t have to say anything. Alternatively, if you don’t know what signs you give when you’re having trouble, you can just ask for “paws up” whenever you feel the start of something happening and your dog will pick up on the subconscious things you do and might even start noticing you’re having a problem before you do. Just a clarification. Emotional support animals aren’t considered service dogs for public access, which is dictated by the Americans With Disabilities Act, so they aren’t allowed to go in non-pet friendly places with their handler. If the dog is trained to do tasks that help lessen the effects of a disability, then it is considered a service dog. Yes, you are completely correct. Animals must be tasked trained to mitigate a disability to be a service dog. Deep pressure therapy can be considered a task for those who have disabling anxiety/panic attacks or for autistic children who get out of control and need to be calmed, etc. Or deep pressure therapy can be used at home for relaxation, or if your dog is an ESA. There are many different scenarios where DPT can be useful. In fact, I will be training this with a new dog for a client who has a ten year old boy with autism (and who is officially disabled because of it) and it will count as a task. This is incorrect. An ESA is a pet that a trained psychiatrist can prescribe you, and is not permitted in a public setting where pets are not allowed. Only a service dog (which is a different prescription that a trained psychiatrist can give you) is allowed to go wherever the general public is allowed. Housing and some forms of transportation, including airplanes, are required to allow an ESA to be with their owner at no additional cost and regardless of species. This includes no pet housing. Service Dogs, regardless of the tasks they are trained to preform are VERY different from ESAs, and are not considered pets by federal law. Only if you are disabled can you have a service dog. A person who has mild depression, or even who just cant be alone in their home can be prescribed an ESA. Service animals can ONLY be a dog or in very rare cases [and usually only for physical disabilities] a miniature horse, whereas an ESA can be ANY animal, because it is there fore the sole purpose of making you feel good, regardless of what it may be trained to do. If you believe you have a disability that could be mitigated by a task trained animal (and it sounds like you do), please contact your doctor or psychiatrist right away, as it could change your life. But even if you decide not to, please don’t lead people to believe that their emotional support pet, trained or otherwise, is a Service Dog. I will give you these links to the section on service dogs in the ADA website, which clearly states much of this information and more, for your own benefit and so that you may have the correct information to give to others. -A Well-Meaning Service Dog Handler. Yes!! Thank you for trying to correct the author… I wish she changed it. — A well meaning ESA owner who hates people abusing the system. On the one hand, I understand what you’re saying, but on the other, an ESA can also help outside the home. They just can’t go into places that are “no pets allowed”. However, they can accompany their handler any place pets are allowed. I suffer from anexiety, depression and mood swings due to a wrist injury and constant pain with fibromialgia. I have an 11 m th old Shepard that I would like to train to help with my issues and to calm me. Where would I go for this. I am overwhelmined to find your site. I will be picking up a puppy this weekend. It is good to know the chances are good that I can train him to be a psychiatric service dog.He is a bisch-poo aka teddy bear I was told they started out as therapy dogs. I will be taking the online course if all possible. If there is any specific books please let me know if you think they would help. I am bipolar have major depression anxiety that causes ibs and post I tried etc I was the less than 1 % I can’t even explain how that was. I thank you for all the people that you help just a little of your life back means so much. I just want to make some comments about the laws concerning service dogs. They are pretty straight forward, but not meant to be discouraging except to people who are trying to get away with something illegal. A well trained dog is not going to draw attention and the law also protects handlers from being discriminated by being harassed by a lot of questions. If you can get your doctor’s recommendation, then have him sign something or keep something on file so if needed a call can be made to his office for proof. Please note that the law says that no service dog needs to be certified or registered. I do however think a vest with a SERVICE DOG notice on it would be helpful. I have two emotional support dogs one which happens to be a pitbull, and very overly friendly but to some she scares them due to her bark, how do I other than slapping g the nose or yelling at her like the housing authority wants me to do, how do I keep her from barking at anyone that walks by or knocks on the door. This is a behavior that she has started since moving into housing. She has become very protective over me. Is it illegal to have your dog trained to comfort you during an anxiety attack at home if you dont fake them as being an emotional support animal? It is not illegal to train your pet to help you in any way at home. However, home training will not allow your pet the same allowances as an emotional support or service dog. Those have to be both trained and registered. Hi Ash! Just to clarify, service dogs do not have to be registered to have public access. All that is required is that you have a disability and that the dog is trained to be behaved in public and to do at least one task that helps with your disability. Can I train a five year old golden retriever to be an emotional support dog? Previous PostPrevious Can I Train My German Shepherd for Therapy Work On My Own?